Abstract. Dual-flow-loop two-filter radon detectors have a slow time response, which can affect the interpretation of their output when making continuous observations of near-surface atmospheric radon concentrations. 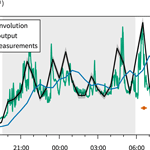 While concentrations are routinely reported hourly, a calibrated model of detector performance shows that ∼40% of the signal arrives more than an hour after a radon pulse is delivered. After investigating several possible ways to correct for the detector's slow time response, we show that a Bayesian approach using a Markov chain Monte Carlo sampler is an effective method. After deconvolution, the detector's output is redistributed into the appropriate counting interval and a 10min temporal resolution can be achieved under test conditions when the radon concentration is controlled. In the case of existing archived observations, collected under less ideal conditions, the data can be retrospectively reprocessed at 30min resolution. In one case study, we demonstrate that a deconvolved radon time series was consistent with the following: measurements from a fast-response carbon dioxide monitor; grab samples from an aircraft; and a simple mixing height model. In another case study, during a period of stable nights and days with well-developed convective boundary layers, a bias of 18% in the mean daily minimum radon concentration was eliminated by correcting for the instrument response. How to cite: Griffiths, A. D., Chambers, S. D., Williams, A. G., and Werczynski, S.: Increasing the accuracy and temporal resolution of two-filter radon–222 measurements by correcting for the instrument response, Atmos. Meas. Tech., 9, 2689-2707, https://doi.org/10.5194/amt-9-2689-2016, 2016.